We are thrilled to announce the Open Source Hardware Association’s annual Open Hardware Summit: the Fifth annual Summit will be held September 30, 2014 and October 1, 2014 in Rome, Italy. It is intended as a community to discuss and draw attention to the rapidly growing Open Source Hardware movement on a global scale. 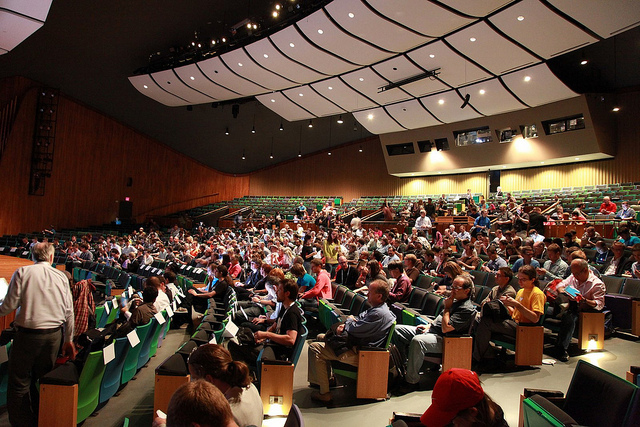 The Summit is a venue to present, discuss, and learn about open hardware of all kinds. The summit examines open hardware and its relation to other issues, such as software, design, business, law, and education. It is the one time a year which the community can come together. Why Europe? We felt it was important after receiving feedback from community outside of the United States to bring the Summit to a larger global audience. The Open Hardware Summit this year will be held in parallel with the Innovation Week in Rome. This will give attendants the opportunity to attend multiple events in a relatively short period of time in the city. Last but not least, thanks to the collaboration with Rome’s Innovation Week we will be able to make the fifth Open Hardware Summit an open event with no admittance fee. We hope this choices will help bring more attention and cooperation to the key topics of open source hardware and open manufacturing. Pablo Garcia demos the Neolucida at the 2013 Open Hardware Summit. In line with this effort towards inclusion and global reach the Open Source Hardware Association will in addition be launching and leading a Session at the Upcoming OuiShare Fest in Paris to announce its expansion and plans to open international branches. The call for talks and workshops for the Open Hardware Summit is forthcoming at 2014.oshwa.org and will serve to bring inspiration from several key Open Hardware leaders to the community. The call will also be an opportunity to propose workshops and co-creative sessions that can produce knowledge and action in the community. That’s gonna be epic. Looking very much forward to meet all #OSHW creators. Pingback: L’Open Hardware Summit 2014 sarà a Roma! | Mia mamma usa Linux!